When cabin fever hits, I am not a pretty sight. My hair has a static-inspired halo decidedly unholy. I do not remain calm. I pace and fidget. I am not the serene goddess you may think I am. I am itchy and creaky and sick to death of pilled winter sweaters. Not to mention, the Arctic Vortex. Capricious El Nino. See if this doesn't help quench your cabin own fever. This soup is lovely as is. I mean it. It's a gorgeous burst of crushed tomato flavor. But if you simply have to kick it up, be my guest. Add a dab of basil pesto on a toasted wedge of crusty gluten-free bread. Or serve with a garnish of finely chopped red onion. What you'll need to do first: Roast some fresh tomatoes. Grab three pounds of plum tomatoes (or vine ripe tomatoes) and wash them gently, thinking of spring (I also added some yellow tomatoes). 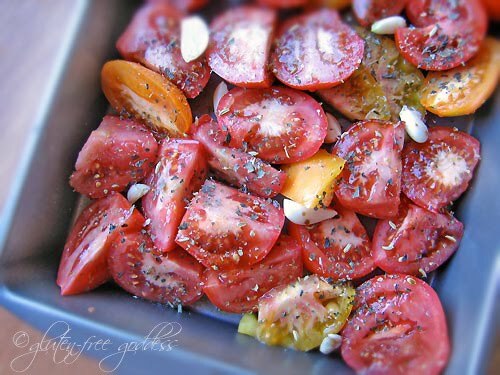 Cut the love fruits (aka tomatoes) in half and toss them into a roasting pan with splashes of extra virgin olive oil, some dried Italian herbs and several peeled cloves of garlic. Add a generous drizzle of balsamic vinegar (to keep this yeast-free use lemon juice or omit). Slide the pan into the oven and gather the next ingredients. The tomatoes should be ready in roughly 45 minutes. Your kitchen will smell like an Italian vacation. In a heavy soup pot heat the olive oil over medium heat. Add the onion and garlic and stir for five minutes. Add the herbs and chili flakes, and stir another minute or two, until the onion is softened. Add the canned tomatoes, raw sugar and broth. Toss in the bay leaf and season with sea salt and fresh ground pepper, to taste. Add the oven-roasted tomatoes and garlic, breaking the pices apart a bit with a wooden spoon. Cover and bring to a simmer; lower the heat and continue to simmer for about 30 to 40 minutes. 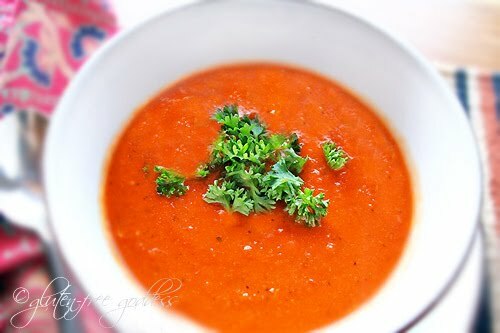 Puree the soup with an immersion blender , (or in small batches in a food processor or blender, tightly covered). Return to the pot. Taste for seasoning adjustments. Heat through. If you like a creamy soup, stir in a half cup of your favorite plain non-dairy milk or cream. If the soup is too thick, add enough hot broth to thin it to the consistency you prefer.